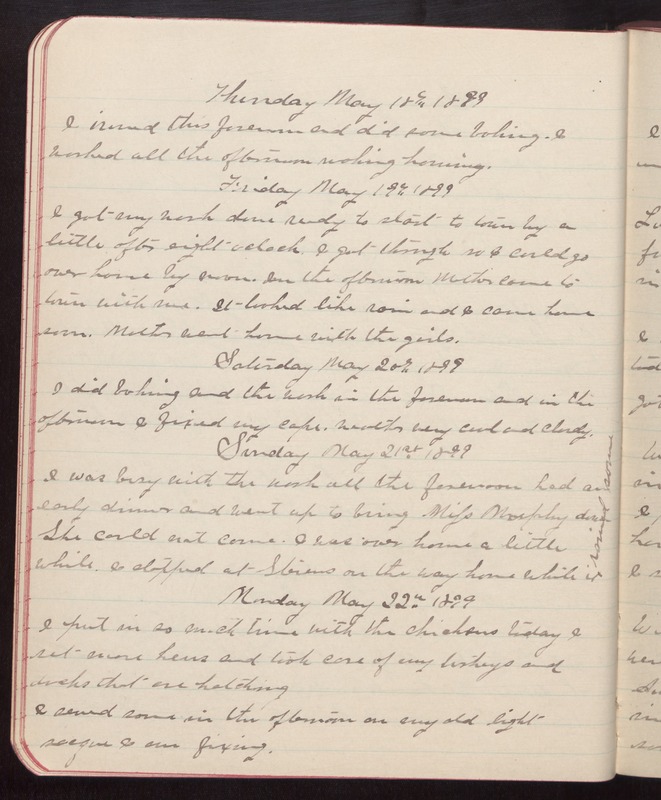 Thursday May 18th 1899 I ironed this forenoon and did some baking. I worked all the afternoon making [housing]. Friday May 19th 1899 I got my work done ready to start to town by a little after eight oclock. I got through so I could go over home by noon. In the afternoon Mother came to town with me. It looked like rain and I came home soon. Mother went home with the girls. Saturday May 20th 1899 I did baking and the work in the forenoon and in the afternoon I fixed my cape. Weather very cool and cloudy. Sunday May 21st 1899 I was busy with the work all forenoon had an early dinner and went up to bring Miss Murphy down She could not come. I was over home a little while. I stopped at Stevens on the way home while it rained some. Monday May 22nd 1899 I put in so much time with the chickens today I set more hens and took care of my turkeys and ducks that are hatching I sewed some in the afternoon on my old light sacque I am fixing.